Hamelex White will be displaying one of their high-productivity vehicles at the Brisbane Truck Show. In addition to the 4 axle dog trailer, the leading Australian trailer brand will also be showcasing a 9.3m aluminium chassis tipper at the show. Hamelex White will also use the industry platform to announce the appointment of Trailer Sales as the brand’s exclusive representative in Queensland and Northern NSW. One of the first trailer manufacturers to offer pre-approved Performance Based Standards (PBS) vehicles in 2009, Hamelex White has since then gone on to become one of Australia’s foremost PBS trailer manufacturers, with a significant number of pre-approved combinations. Hamelex White’s 4 axle dog trailer is capable of carrying 34 tonnes on approved roads and is perfect for use in quarry applications. General Manager Craig Wallace observes that PBS vehicles still have a great deal of untapped potential in this country and customers can easily experience great productivity gains with Hamelex White’s pre-approved equipment. He explains that pre-approval eliminates the usual delays often associated with PBS equipment, enabling operators to place an order knowing the completed vehicle meets PBS requirements. Speaking about the change of distribution, Craig says that the move is the result of a careful review of the brand’s distribution options. 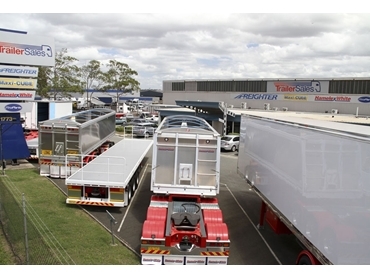 Trailer Sales is Queensland’s pre-eminent supplier of semi-trailers, parts and service, having been the Queensland distributor for the leading Freighter and Maxi-CUBE brands for many years. From distributing Hamelex White in North Queensland alone, Trailer Sales has now become the exclusive distributor for the brand in Queensland and Northern NSW. Craig believes Queensland customers will be best served by having one dedicated dealer acting as a true one-stop-shop in multiple locations. Hamelex White can be found on stand number 30 at the Brisbane Truck Show 2013, which will run from 16th to 19th May at the Brisbane Convention and Exhibition Centre.